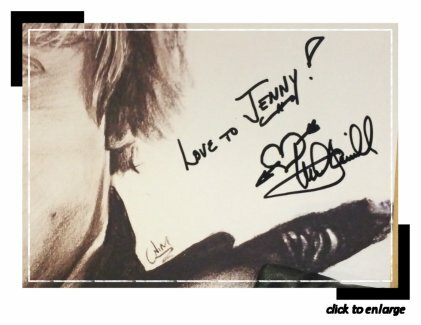 So there's a funny story about when I got Mark Hamill's autograph two years ago today that I haven't shared yet. Thing is, I’d been told by staff that it would probably be very hard to get his autograph. 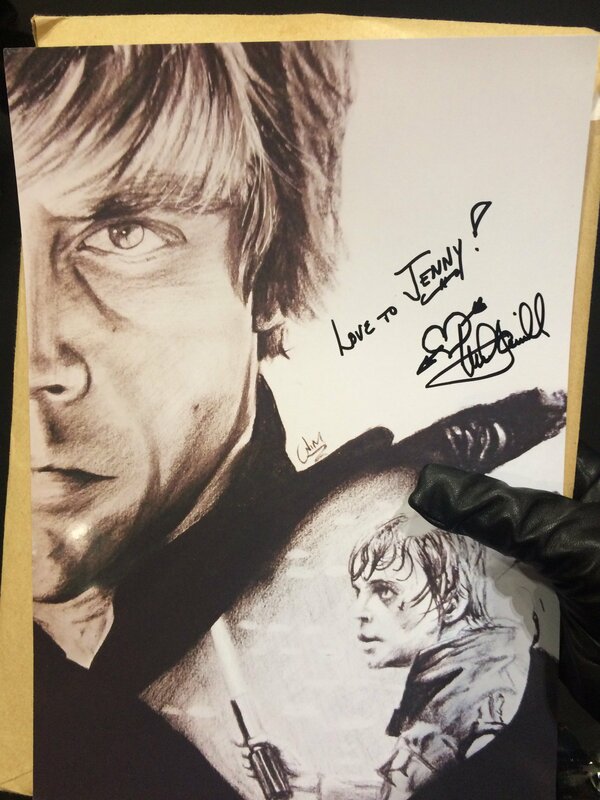 They had a numbering system; when I arrived outside the autograph area when I first got there in the morning, there was a sign saying "MARK HAMILL 1-100" and already a long line. Then when I asked a member of staff, they gave me a slip of paper with a number on: first 645, then a kind stranger gave me a spare 550. Told them I had to leave around 5-ish, and they told me I probably wouldn’t get his autograph since they wouldn’t reach either number by then. Which was devastating at the time considering I had a six-page handwritten letter to give to him – and let’s face it, I wanted his autograph, dammit. About four hours later I went there again to see if they had POSSIBLY reached that number yet. Nope, they hadn’t. The same staff member who I’d spoken to earlier saw me, and muttered to me: “Listen, why don’t you just…get into the queue." After my jaw dropped and I started asking if he was sure and if he was allowed to do that, he just went “Yes, just don’t tell anyone, okay?” He then assured me that they don’t look at your number as you go in and told me to keep my mouth shut. SO IT IS LITERALLY THANKS TO THIS GUY – THIS KIND MAN, THIS SAINT, THIS PARAGON – THAT I EVEN GOT HIS AUTOGRAPH IN THE FIRST PLACE. THANK YOU, STAFF GUY. WHEREVER YOU ARE. After waiting for nearly THREE HOURS because he'd gone for his lunch (during which I kept myself busy with the internet, eating Fruit Pastilles and attempting to nap since I'd only had about 3 hours sleep out of nerves), I was FINALLY near the front. Keeping in mind that although I'd already had a photo with him earlier and seen how INSANELY nice he is, I was still really nervous; it was still so surreal seeing him in the flesh. And now I was smuggling an envelope after we were told that the general rule for gifts was "no". 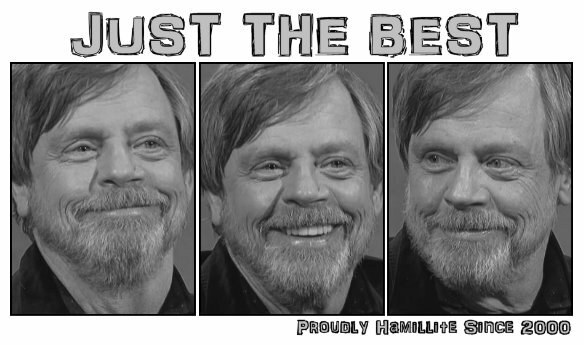 So basically, since this is Mark Hamill we're talking about, who is known for being Troll Extraordinaire™....yeah. I think I got trolled by this man. ...and was completely silent. Didn’t even look at me. Didn’t once look up, say a word, he just signed my picture. And I fell for it HOOK, LINE AND SINKER. I started panicking, opening and shutting my mouth like a goddamned fish and looking around wondering what the hell to say. Being me, of course, my thought process was: “Oh God, it’s been a long day and he’s probably had enough, he’s going to act really dismissive and mean to me now, he’s not going to say anything, is he thinking ‘not this girl again’, what do I do what do I do WHAT DO I *DO*"
That’s when he finished signing it, gave me the picture, finally looked at me, gave me a big smile and said: “Here you go, Jenny!” In what is one of the kindest, warmest, most disarming ways anyone has ever spoken to me. Then in a millisecond I went from absolute panic... to unlimited joy. The rest of the meeting went without a hitch; he was SO SWEET, I thanked him, I asked if I was allowed to give him my letter (after hiding it), he said “Of course!”, he complimented my calligraphy on the envelope ("It took me a while to get it right." "I can tell!"). And then - after asking me - HE KISSED ME ON THE FOREHEAD. Then I left in this weird, shocked daze - then I had to run, partly out of shock and because I had 8 missed calls from my mum since it was a no phone area, but not before a guy supervising the autograph area deadpanned: “Yeah, he kissed you” after noticing my face and stuttering. 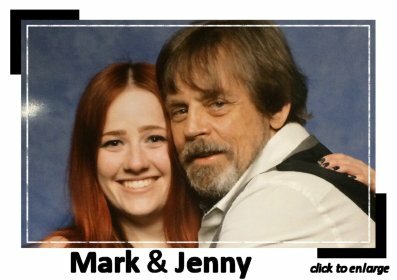 So yeah, there’s the story of how I got trolled by Mark Hamill. 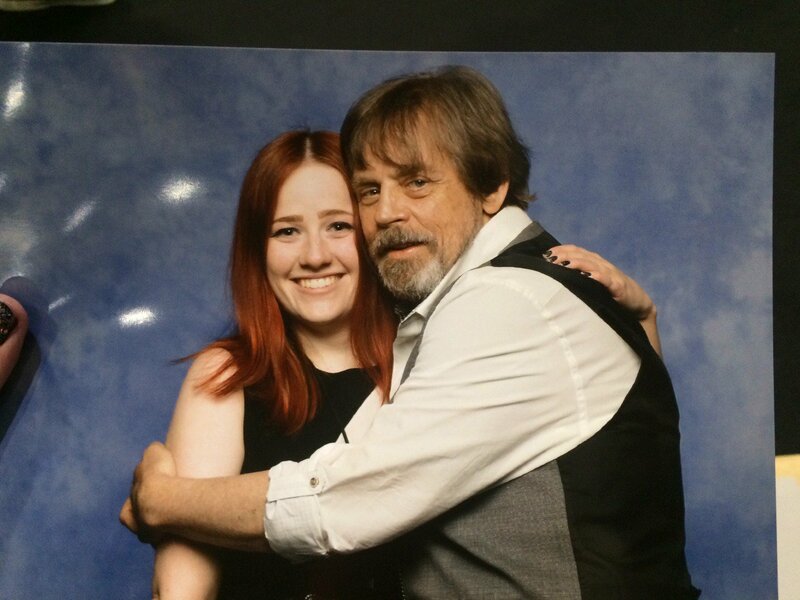 I don’t know whether it was because he’d seen how nervous I was, or if he’d recognised me from earlier and had seen how even MORE nervous I’d been in THAT queue, but it was a joke that I find completely hilarious in hindsight that actually succeeded in putting me a bit more at ease in talking to him. It actually took me a couple of months for me to realise what he'd done. So thank you, Mark. Thank you for that, and for everything else. I'll never forget that. And I hope you DID like that letter.